Yeah, yeah. Whatever. I’m in. This time, I’m blaming Cookie. She’s an evil-along pusher. I may even be down for the most socks and socks on vacation contests. 02. As much as I’d love it, Cookie and I are not long lost cousins. /SOB! 03. If I go, I’m doing Puerto Rico alone. Sorry, no mystery man there either. 04. WOW, you all must have some image of me. I wish I had game like that… or that I played the game like that…or something. 05. SF = Security Forces. The Air Force version of cops. 01. No necesito a nadie para hacerme feliz. 02. Sometimes, you say what you mean and mean what you say. No hidden meanings, no innuendos, no reading between the lines and no game play. I like it that way. Even if it is a little scary. 04. The winds were so high that the power went off about 6 last night and didn’t come back on until 3 a.m.
05. I think that was the earliest I’ve been to bed in months. For that, I blame Angie. 06. I saw the toe doc Tuesday after the beach and he made it hurt. Owie. I need chocolate. 07. I’m so glad I decided not to go to L.A. today. Today is the whole Mayday “peaceful” protests. Yeah. 08. The NRA banquet is Saturday! WHOO! And then I’m going out after. I have to figure out how to go from conservative repubican NRA attendee to wild liberal democratic party girl without exposing anything during the quick car changeroo. Author stacey919Posted on May 1, 2008 Categories UncategorizedTags baking, friends, life7 Comments on Fine! I give! La surprised me with a little something for my birthday. One of the awesome Lean Cuisine Susan Komen Foundation lunch bags – that thing is huge, and pink. A nice coffee cup which may have been a bad idea for someone as Polish as I. I may or may not have spilled a bunch of coffee three (count ’em, three) times when I picked it up and tried to drink out of the doggy head side. You can dress me up, but you can’t take me out. 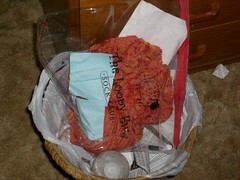 Of course she included some fabulous yarn. Koigu. YUMMMY! The colors in this skein are AMAZING! I’ve never used it before, so I’m anxious to give it a try. Just for Nora. There you go. There’s the stinking, rotten Forest Canopy. It shall not be spoken of until it shapes up and behaves. Freakin’ lost stitches. 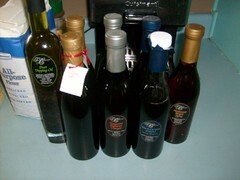 My annual stock-up of gourmet balsamic vinegar. And there may be a new product in there that he is carrying this year: Hennessy Maple Syrup. I think I need to crack out the waffle maker. This post was written Sunday while baking something you’ll see tomorrow and indulging in a yummy Newcastle beer (or two, or three). There is a new birth control pill out there called Seasonique and I kept hearing the commercial saying “seize the meat”. While that may be fun, I don’t think it would be an as effective birth control as other means. Time to put down the bottle wouldn’t you say? * ‘Cause it might hurt less than the floppy and La killing me. O.k. those of you who know the song can stop snickering now. PERVERTS! Yeah, I know. No Saturday Sky. I was distracted by lace. You all understand, right? Tomorrow I’ll do Sunday Sky. It’ll be worth it for all of you snow birds. One word. Wisteria. Guess what? We have a knitter! The lovely Nora has finally admitted she may officially be a knitter. HAHAHAHAH! She has no idea of where this is going. Should I tell her about La’s “I’m not going to have a stash” delusion? Or about how, now that she’s boarded the crazy train, she’s going to need a freezer just to house it. How about I send her to see this? Lightly oil a loaf pan and “flour” with the flax seed meal. Mash the bananas and mix with the honey, canola oil and vanilla extract. Stir together the whole wheat pastry flour, baking soda and salt. Add the nuts and raisins. Blend the two mixtures and spoon into the loaf pan. Sprinkle a little flax seed meal on top. Bake for 40 minutes at 350, or until center is set. *Two faced because it’s a healthly, all natural – mine was all organic too – and you think it’s going to taste healthy, (come on, you know what I mean) but it is scrumptious. If you’re even thinking about knitting lace, head on over to this post and tell her you’re Knitting w/ Nora. 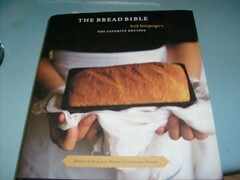 Author stacey919Posted on March 29, 2008 Categories Knit w/NoraTags baking, Cooking, Knit w/Nora4 Comments on I’m cookin’ now!